On Monday 16 July, the London 2012 Olympic Torch Relay – presented by Coca-Cola, Lloyds TSB and Samsung – will travel 94.70 miles through 19 communities on its journey from Portsmouth to Brighton and Hove. 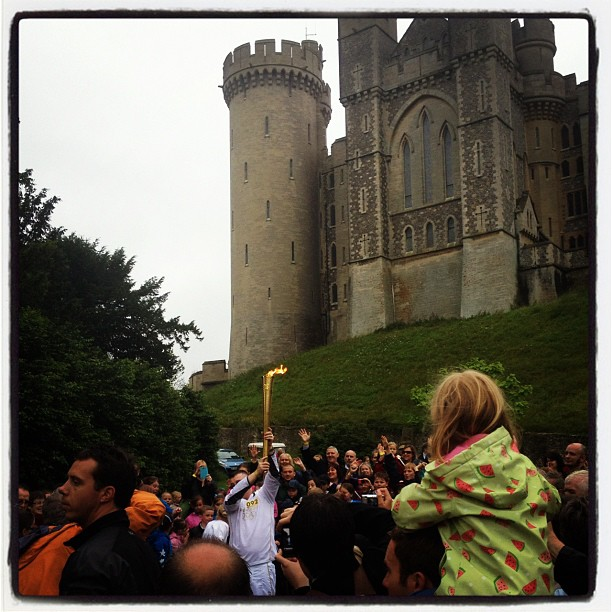 The Flame will be carried through the following communities: Portsmouth, Petersfield, Rogate, Midhurst, Easebourne, Tillington, Petworth, Duncton, Chicheser, North Bersted, South Bertsted, Bognor Regis, Woodgate, Westergate, Arundel, Worthing, Lancing, West Blatchington and Brighton and Hove. 7.29am – Portsmouth Football Stadium: The first Torchbearer of the day is John Jenkins, 92, from Portsmouth who will carry the Flame inside Fratton Park. John was nominated for his life-long support of Portsmouth Football Club. He has dedicated over 50 years to working for the club in one form or another. On his retirement in 1984, John began volunteering at the ground and is a much loved club steward who has looked after the boardroom and corporate guests for the last 18 years. 9.52am – Cowdray Park Golf Club: Gail Whattingham, 66, from Farnham who was nominated through the Coca-Cola Future Flames programme for her charity fundraising will carry the Flame into the Golf club. 10.34am – Petworth House: Sara Tremlett, 63, from West Chiltington who was nominated through the Samsung campaign for her work as District Commissioner of the Lord Leconfield Pony Club will carry the Flame into the grounds and around Petworth House. 11.20am - Cass Sculpture Park: a Torchbearer will carry the Flame in front of the sculptures. 3.59pm – Arundel Castle: Jason Saw, 42, from Brighton will carry the Flame into the grounds of Arundel Castle. Jason was nominated through the Lloyds TSB campaign for his leadership of a project called MINDOUT which aims to tackle mental illness in the Brighton Lesbian, Gay, Bisexual and Trans community. 6.50pm - Sussex County Cricket Club: the last Torchbearer of the day Karen West, 60, from Worthing will carry the Flame on to the evening celebration stage in Brighton and Hove. Karen was nominated through the LOCOG campaign for her outstanding work as a nursing sister at Goring Hall Hospital. She is patients’ guardian angel through their fight with cancer and is there 24/7. Our cancer journey would be far harder without that phone number we can always ring, she is a true inspiration with all her patients. The evening celebration will feature a variety of entertainment staged by LOCOG and the three Presenting Partners of the London 2012 Olympic Torch Relay - Coca-Cola, Lloyds TSB and Samsung - with support from Brighton & Hove City Council. The evening celebration will take place in Sussex County Cricket Club in Brighton and Hove. The line-up includes music from Brighton’s very own Rizzle Kicks, also a dance troupe who will provide a unique fusion of street performance, theatre and sport and dance act Twist and Pulse. There will also be performances from local groups The Carousel Choir and The Brighton & Hove Youth Big Band. Towards the end of the two-hour show, the last Torchbearer of the day – Karen West - will light a celebration cauldron on stage at the event which will enable the Olympic Flame to be seen by the audience. Linvoy Primus, 38, since joining Portsmouth Football Club in July 2000 Linvoy Primus has been tireless and unstinting in his work in the community and in 2001 he co-founded his own charity -'Faith and Football'. The charity was founded to work in partnership with other local agencies and authorities to identify, help and support disadvantaged youngsters aged 7-18 years in areas of multiple deprivation in Portsmouth whose life chances were limited socially and economically. Under his patronage the charity organises and runs sporting and educational programmes in the city. As an example up to 100 volunteers, serving 600 youngsters, run free evening Community Youth Football programmes to provide healthy exercise and aid personal development. Linvoy has also worked as an ambassador for Portsmouth FC in the community and many groups and initiatives large and small continue to benefit greatly from his personal patronage and support. April Hornsey, 15, April, was nominated by Portsmouth City Council through the LOCOG nomination campaign. She has been involved with the Kids are Alright Project. April has recently completed both Sports Leaders Level 1 and Sports Leaders Level 2 during the last two school holidays and is looking for a career in Community Sports. A great role model for young people. Julia Zeen, 30, from Brighton carrying the Flame in Lancing. Julia was selected through the Coca-Cola Future Flames programme, Julia is a graphic designer who worked with Coca-Cola to develop a range of pin badges for London 2012. Christopher Lynch, 57 from Littlehampton, nominated through the Lloyds TSB public nomination campaign has been a policeman in London for thirty years, and now works for the Sussex Resilience Forum to make Sussex a safer place. Christopher, who is carrying the Flame in South Bersted, has converted an old London bus into a community centre with the help of many people including prisoners from Ford Open Prison, and takes it to young people in the area. Samuel Kirwan, 21, from Burgess Hill and carrying the Flame in Westergate. Sam, who was nominated through the LOCOG campaign, is an inspirational young person. Twice a year he gives his time and his money to take both the terminally ill and young people with life limiting diseases on pilgrimage to Lourdes. He provides them with 24/7 personal care and support, giving these deserving people a chance to have a once in lifetime experience, and bring them some joy before the worst happens. Sam is heavily involved in the local cricket team, he plays twice a week and also coaches the younger teams. Sam gave a great deal of time to a 'street cricket' scheme, where he and his fellow team-mates gave local children the opportunity to get involved in a sport that would otherwise be inaccessible to them. At university Sam captains the hurling and cricket teams, and is a student ambassador for incoming students giving up his time to welcome and advise new students. Sally Biggs (nee Gunnell), will carry the Flame in Bognor Regis. Sally is one of the most popular British female athletes, and her gold medal winning performance in the 400m Hurdles at the Barcelona 1992 Olympic Games is an iconic moment in British sporting history. She is the only women to date to concurrently hold all four major championship medals – Olympic, World, Commonwealth and European, a feat she completed in 1992 along with the addition of a World Record time. Since retiring from athletics, Sally has put to good use her wealth and experience of knowledge to help inspire upcoming athletes and encourage families to get healthy across a variety of programmes. Robin Cousins, from Brighton will carry the Flame in Brighton. Robin is British Winter Olympic gold medallist. It was at the Lake Placid 1980 Olympic Winter Games that Robin won the men’s figure skating title. After a successful career as a professional skater, he formed his own ice-skating performance company with whom he toured the world. Robin is also involved with hit television show ‘Dancing on Ice’ where he is the head judge, inspiring the public to participate in ice skating. As a Team GB 2012 Ambassador Robin is bringing his Olympic and sporting experiences to the world of Synchronised Swimming and is currently heavily involved with the personal and competitive development of the team. Kevin Betts, 28, is carrying the Flame in West Blatchington. Kevin was nominated through the Samsung campaign for running 52 marathons for charity, all in under 4 hours. He ran a marathon on his stag do, one on his wedding day and on his honeymoon as well. He is raising money for two charities, Passing it On - a charity which helps build schools in Africa, and for Rethink - a charity which helps the families of suicide victims.